Love him or hate him, there is no denying that James Brown is a musical legend. At an exclusive screening of Get On Up, I glanced around the room to see almost everyone bopping their head as the unmistakable “Whoah” of I Got You (I Feel Good) screamed through the speakers. No wonder producers Mike Jagger and Brian Grazer wanted to tell Brown’s story. Get On Up tells the incredible life story of American music legend James Brown, from his impoverished childhood to his evolution into one of the most influential figures of the 20th century. Directed by Tate Taylor (The Help), the cinematic biopic takes a fearless look inside the music, moves and moods of Brown with Chadwick Boseman in the leading role. The story starts with a flashback from 1988 with Brown (Chadwick Boseman) bursting into an insurance seminar wielding a shotgun, demanding to know who used his adjoining bathroom. The bizarre scene seems an odd place to start the film, but then again, Brown was a bizarre and odd character. Just as quickly, we jump to Vietnam, as a plane carrying Brown and his bandmates comes under attack. “They tried to kill James Brown today!” he yells in disbelief, before suddenly, we’re back in 1930s Georgia, as young James watches his father beat his mother. Throughout the film, screenwriters Jez and John-Henry Butterworth juxtapose moments of triumph with scenes of horror. For example, as James wanders into a church to hear gospel, we then see him stealing a suit, landing him into jail for the first time. As young James is beaten by his father, we cut to an older James singing “I Feel Good” to a studio audience of smiling white kids. It may seem a little confusing at first but give it time and you’ll begin to appreciate the genius behind it. We start to see how Brown grew from a shy and fearful child young boy into the hardest working man in the business and the Godfather of Soul. Whilst Brown was undoubtedly a talented musician, ironically, he was a soulless man in his personal relationships. Domineering, cruel and egomaniacal, Brown’s arrogant, selfish and self-absorbed ways resulted in him losing many of his friends and family along the way to stardom. He was also a brute to women, a theme which is only touched on briefly in the film, when he strikes wife Dee-Dee and chastises her for wearing a revealing dress. Several journalists have criticised parts of the film, stating that key facts and incidents were omitted. Whilst I don’t know enough about Brown’s story to judge, I do think some themes could have been explored further, particularly Brown’s relationship with women, his social activist work and even the way his music was made and the colossal effect it had on culture. The star of the film is Chadwick Boseman who is superb as James Brown, delivering one of the best performances of the year. His electrifying performance is Oscar-worthy and his portrayal of Brown’s rhythmic rasp and famous dance moves is outstanding. The supporting cast are also excellent, particularly Nelsan Ellis as Bobby Byrd, Brown’s long suffering friend and bandmate, and Dan Aykroyd as Ben Bart, Brown’s subservient Jewish manager with whom he seemed to enjoy a successful relationship. If the story doesn’t get you, the killer soundtrack certainly will. The film features 20 remastered original recordings, with Boseman flawlessly lip synching the numbers. 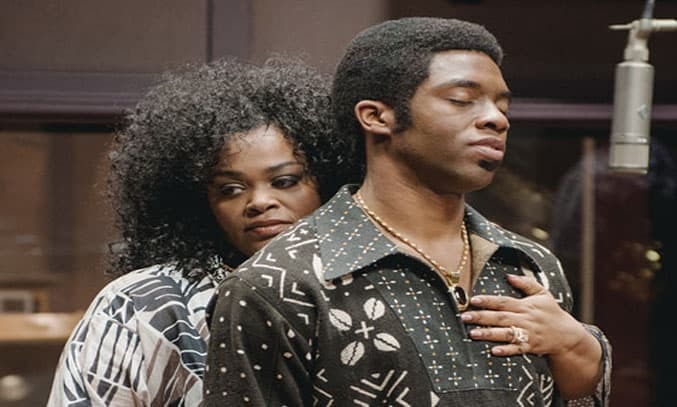 The driving, insistent beat is sure to get your foot tapping and Boseman’s movements are mesmerizing, with the actor giving everything of himself to the role. The film has been well received in the press with many critics praising Boseman’s performance. Tom Shone of The Guardian described it as “one of the year’s truly outstanding performances, even if the movie never quite penetrates Brown’s rhino-rough hide” while Scott Foundas of Variety said “Chadwick Boseman triumphs as James Brown in Tate Taylor’s sturdy but sanitized take on the Godfather of Soul.” The film is tipped for an Oscar at next year’s Academy Awards. Lively, energetic and dynamic, Get On Up is a fitting homage to the Godfather of Soul. Get On Up is on general release in the UK on 21 November 2014.